Timeshare Donations – Fact or Fiction? Alert! – Timeshare Donation Advisory – Alert! Have you ever thought about donating your timeshare? Are you concerned about the possible risks of breaking federal tax laws by claiming a timeshare as a donation when it seems to be otherwise worthless? Were you contacted by a company promising to eliminate your timeshare burden by helping you donate it to a charity and claim thousands of dollars in charitable tax credits? Are you aware that it is illegal to donate a timeshare and claim a false fair market value? Have you heard all these great promises about how you can write off thousands of dollars for a timeshare you can’t even sell for a single dollar? How many times has it just felt like a scam? Learn how our transfer process works and then sign up for a free consultation to to get out of your timeshare from the convenience of home and without the risk of being ensnared in a tax fraud scheme. Our inexpensive, low-cost, no-haggle timeshare redemption service is typically thousands less than others charge. More importantly, we offer free consultations that wil help you to pick the right service that genuinely fits your needs. 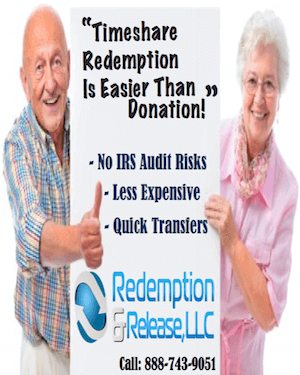 Redemption and Release, LLC has helped thousands of distressed owners just like yourself with their passionate resolve to achieving timeshare freedom and honest and fair approach to customer service. We guarantee all our services and use a licensed, bonded, and insured title agency to protect your money and our reputation. Choosing to do business with our company provides you the peace-of-mind knowing that you are dealing with a company that stands behind its promises. If you would like a FREE individual consultation from one of our Redemption Specialists, do not hesitate to call us now at 888.743.9051. Remember, as a guest of this site you are also granted access to our exclusive Timeshare Help Articles.